Consult your physician for the latest health requirements for travel to Kenya and Tanzania. We do not recommend this vacation to people with serious back problems, as it can be quite rough on some East Africa roads and game park trails. Due to limited capacity on safari vehicles and flights, your suitcase must be soft-sided and cannot exceed 33 lbs, including hand luggage. Some minor changes in your daily itinerary may be expected due to wildlife migrations and viewing. Sightseeing vehicle in Nairobi. Safari mini-bus, between destinations and for game drives, with a pop-up roof for easy game viewing and photography. We limit each safari mini-bus to a maximum of 6 people, ensuring you’ll always have a window seat. ARRIVE IN NAIROBI, KENYA. Welcome to Africa! Arrive this evening, check in to your hotel, and prepare for your safari adventure! 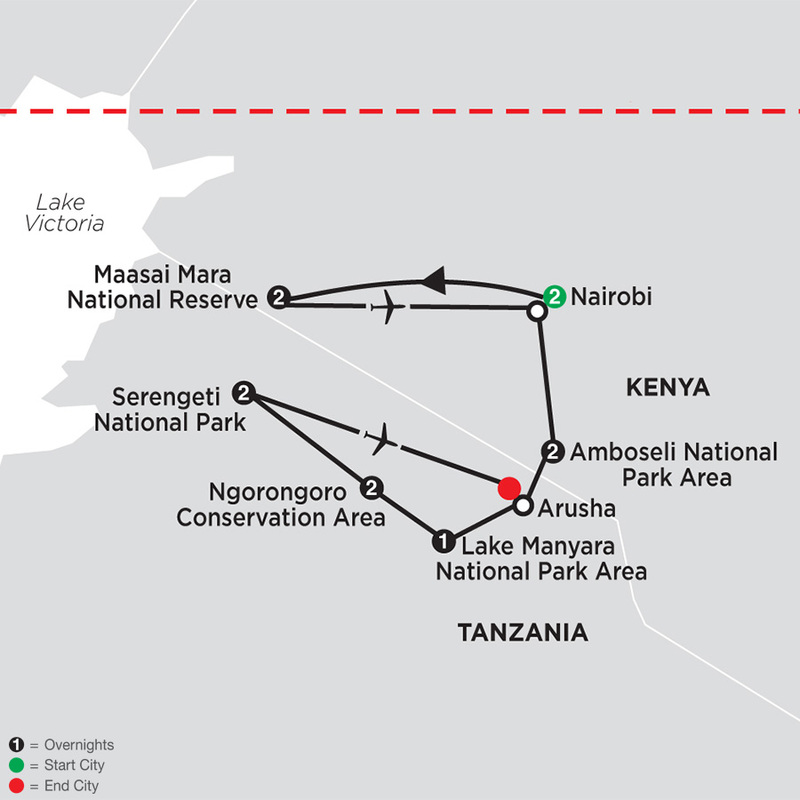 SERENGETI–ARUSHA–DEPARTURE. This morning, fly back to Arusha, where your tour ends. We have secured a day room at the Mount Meru Hotel for you to use prior to your homebound flight. Book homebound flights after 5 pm.